Hardwood flooring has been a standard of elegant and luxurious interior decoration for decades. They are known for their extreme durability and lustrous glow. However, there are certain requirements for adequately maintaining the look and feel of hardwood floors for long periods of time. Failure to properly care for hardwood flooring can cause it to appear dull and worn. By following these tips, your hardwood floors will last for years without losing the intrinsic beauty associated with a natural floor finish. Wood floors are typically finished in several different ways. Care is provided based upon the type of finish used. Some types of wood flooring require very little in the way of maintenance while others may need extra attention to ensure the best possible appearance. If a wood floor has been finished with a protective substance such as polyurethane, the floor requires very little maintenance. Simply spot cleaning and regularly vacuuming or mopping will provide sufficient care in retaining the original brilliance of the flooring. Occasionally, such floors will need to be recoated. However, these types of floors should never be waxed or cleaned with chemicals designed for vinyl. Wax finished wood floors require the same standard of vacuuming and mopping. Additionally, these floors can be periodically buffed to increase their shine. If buffing no longer helps, it is probably time to re-wax the floor. Make sure to coat and buff the floor evenly to avoid overly bright or slippery spots. Avoid a high buildup of wax in high-traffic areas as these spots can become dangerous for people walking across the floor. For dirty wax floors, apply a wax-based cleaner and buff afterwards to remove dirt while maintaining shine. While many people may believe that cleaning products can be used across the board, it is important to take precautions when cleaning hardwood floors. Never use a product designed for vinyl on wood floors. This can strip the finish and cause the floor to look dull or uneven. 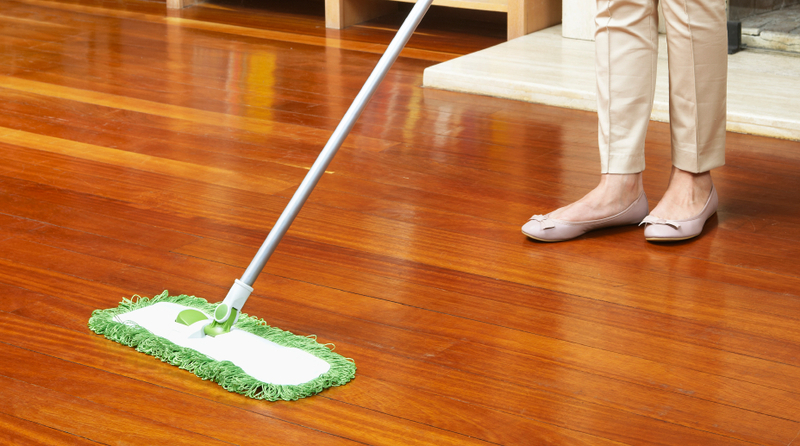 Damp mops should also not be used to clean wood floors. Too much water can damage the wood and may require it to be replaced. If you already have a hardwood floor or you are thinking of changing to a hardwood floor, call or stop by Flooring HQ. The flooring experts will provide you with all of the information you need regarding hardwood floor maintenance as well as options for the best type of hardwood floor for your home.